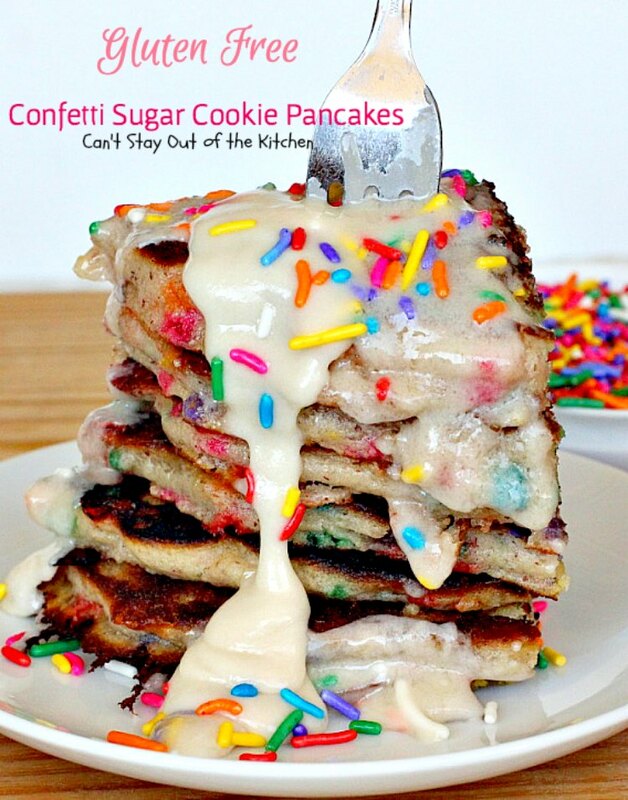 Gluten Free Confetti Sugar Cookie Pancakes are amazing. Warning! While these spectacular pancakes are gluten free they are in NO way healthy! 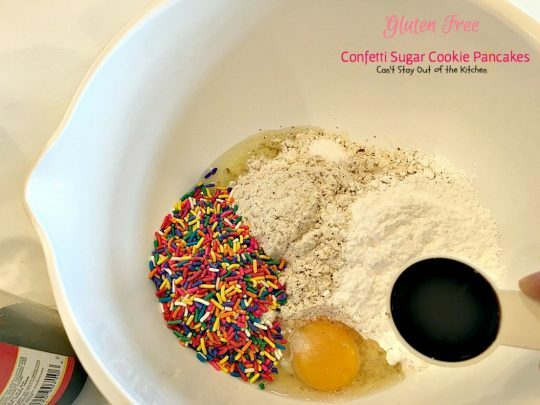 They are filled with what makes sugar cookies so great – LOTS of sugar, confetti sprinkles and then topped with a luscious buttercream frosting-type syrup and more confetti sprinkles. 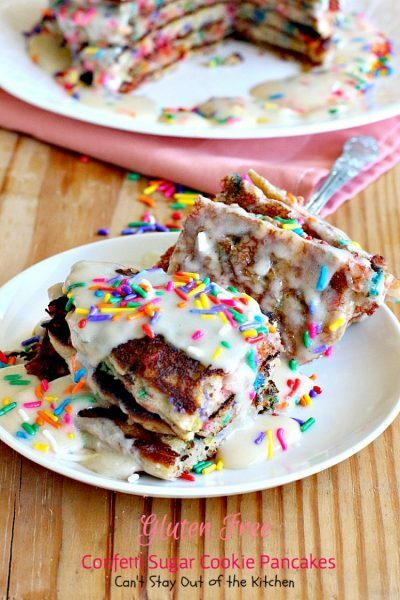 These rich, decadent pancakes are as delicious as eating dessert! They are an extremely satisfying breakfast meal for sure! I wanted to make these pancakes as close to sugar cookies as possible. I also wanted to use up a LOT of confetti sprinkles. In my case, I used two bottles of the sequins for this recipe in an attempt to get rid of some of them and clear out my pantry! I used gluten free flour in these pancakes but if you are not gluten intolerant you can substitute any pancake mix. Our favorite is Krusteaz. 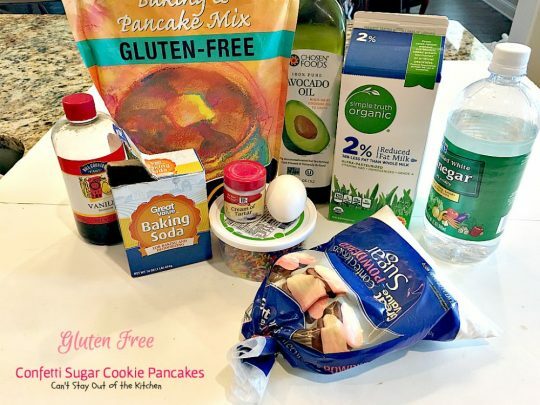 They have quite a variety of great pancake mixes. 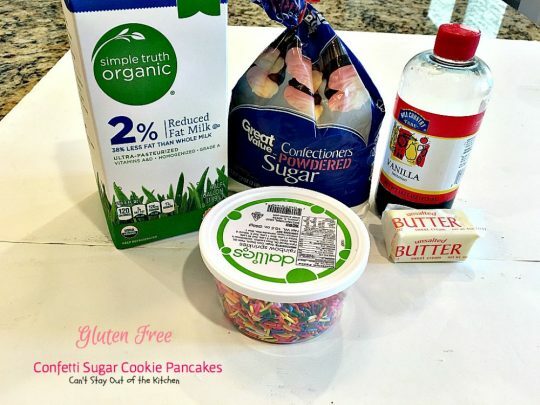 If you’re in the mood for some marvelous sugar cookie-type pancakes then this recipe is for you! I loved these pancakes and the icing I made for them. I would recommend that you make the icing very thick because it will thin out considerably once it’s ladled over top of the hot pancakes. 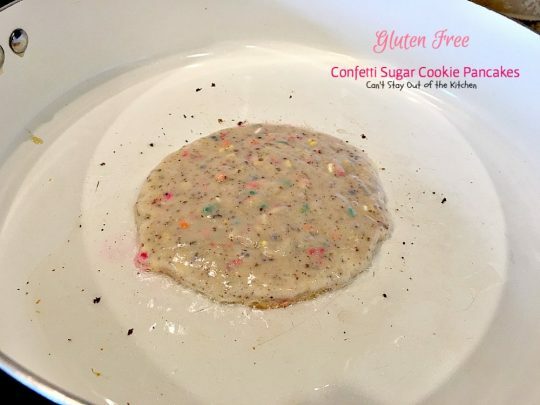 Gluten Free Confetti Sugar Cookie Pancakes were heavenly–like eating sugar cookies with lots of confetti sprinkles. 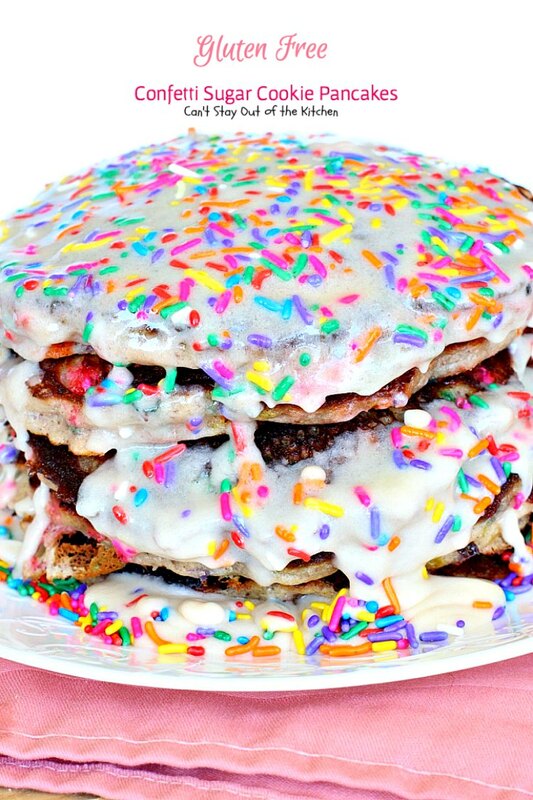 Confetti icing on top of the pancakes makes them heavenly. Gluten Free Confetti Sugar Cookie Pancakes will satisfy even the strongest sugar cravings! Measure baking mix into a bowl. 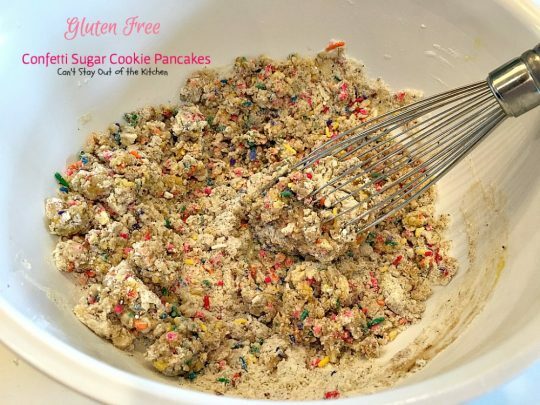 Add an egg, oil, powdered sugar, cream of tartar and rainbow sprinkles. Stir to combine. Mixture will be very dry. Add a few tablespoons vinegar to milk to sour the milk. Allow to sit out about 3-5 minutes. Add baking soda to soured milk. Mixture may foam. 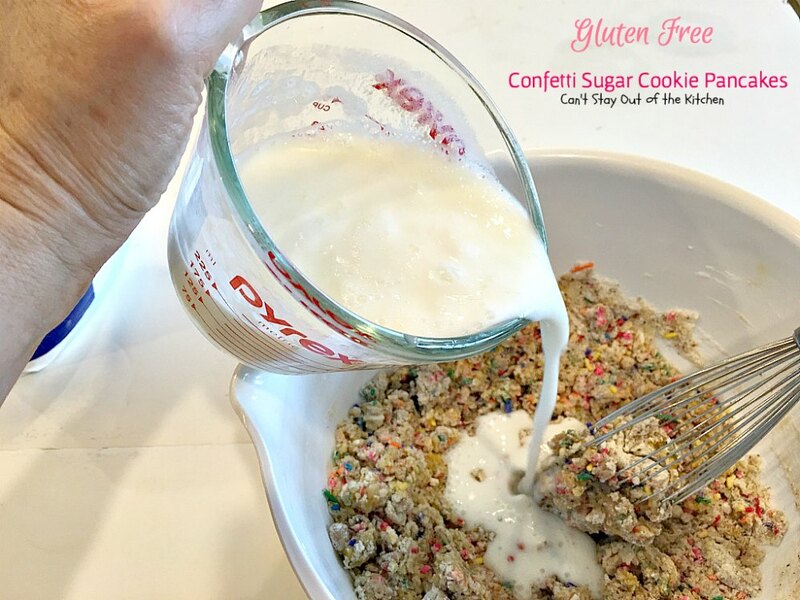 Add milk mixture to other ingredients in bowl. 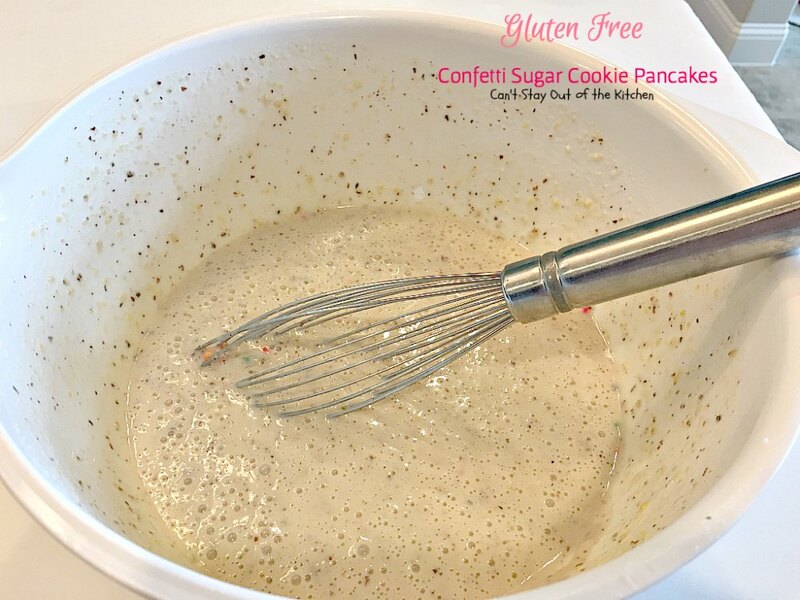 Pour pancake mixture into greased skillet or griddle. Turn when pancake starts getting bubbles throughout the top of the pancake. Stack cooked pancakes on a plate. I used these ingredients for the icing. Meanwhile, prepare icing. Soften butter then cream it with a mixer or whisk. Add powdered sugar, vanilla and water. Be careful, add as little water as possible. The icing needs to be thick. 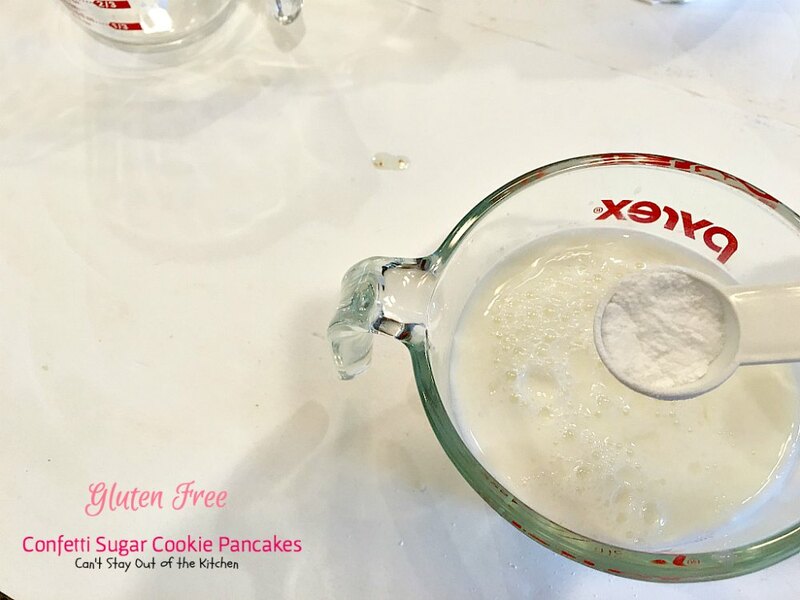 Mix with electric mixer or whisk until smooth. Make icing as thick as possible. To serve: Stack pancakes on plate. Spoon icing over top. Garnish with rainbow sprinkles (jimmies), sequins or funfetti, if desired. These pancakes were so delicious. They are so rich you don’t need to bother putting butter between the layers! You won’t believe how marvelous Gluten Free Confetti Sugar Cookie Pancakes taste. 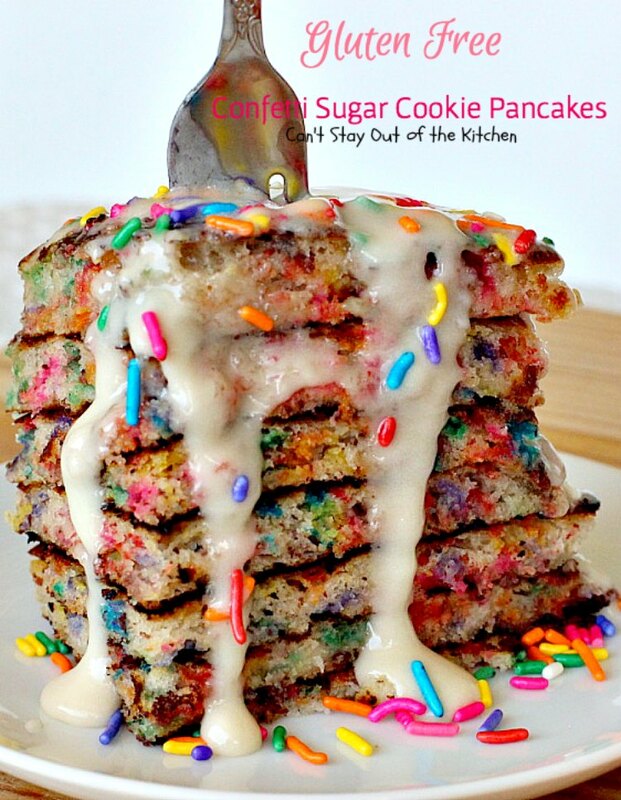 Absolutely scrumptious pancakes that are reminiscent of sugar cookies loaded with funfetti sprinkles. These are drizzled with powdered sugar icing and sprinkled with more funfetti. 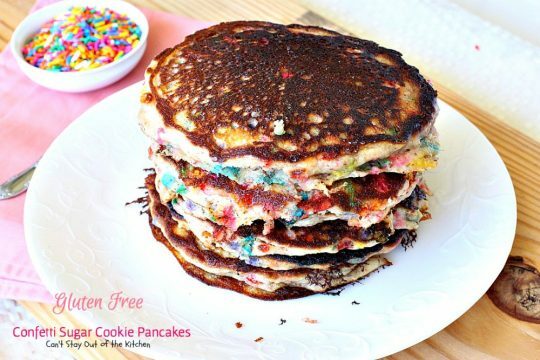 These pancakes are gluten free. Measure milk in a measuring cup. Add vinegar and allow milk to sour like buttermilk for about 3-5 minutes. 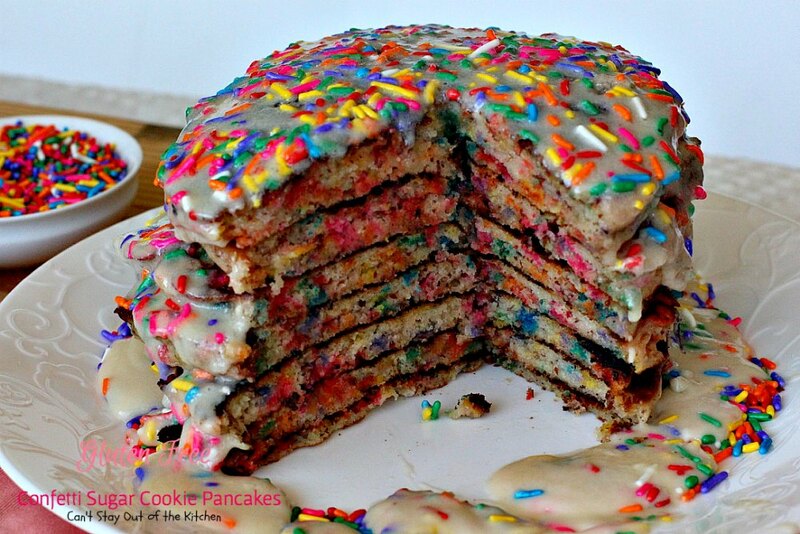 Meanwhile, measure pancake mix, vanilla, egg, oil, powdered sugar, cream of tartar and sprinkles into a small mixing bowl. Once milk has thickened pour into mixing bowl and whisk ingredients together. Spoon pancake batter into buttered skillet or griddle. Cook on one side until bubbles appear on surface and edges appear cooked. This will take a few minutes. Flip pancake and cook on remaining side until done another minute or so. Place on serving plate and keep warm. Makes about 8 six-inch pancakes. Meanwhile, prepare frosting for pancakes. To serve, place pancakes on a plate. Add more sprinkles, for garnish. Frosting mixture will be thick but it has to be thick so it doesn’t dissolve over the hot pancakes. 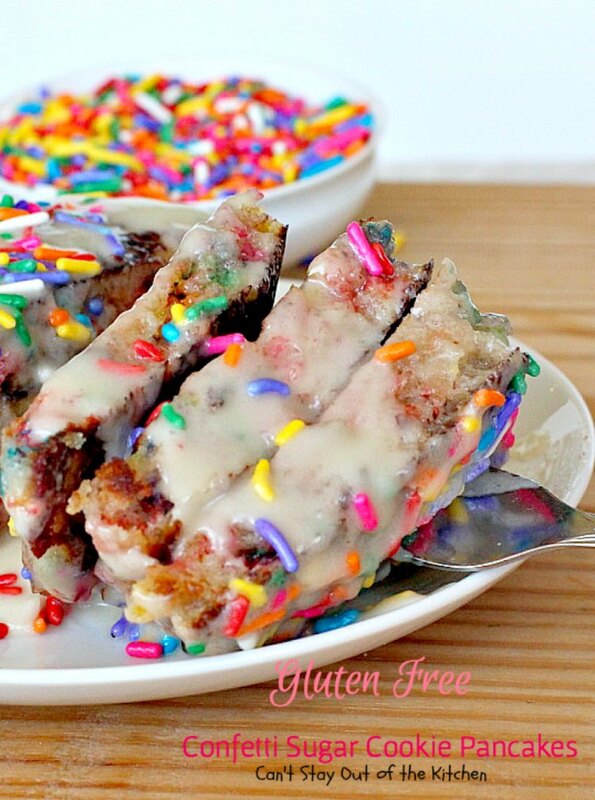 Sprinkle with additional confetti sprinkles. NOTE: Be careful not to add too much milk to the frosting. The mixture needs to be thick or it will dissolve into the pancakes. Bake on one side until bubbles appear on surface and edges appear cooked. Makes about 8 four-inch pancakes. Add more sprinkles, sequins or funfetti. Sprinkle rainbow sprinkles or sequins over top for garnish. 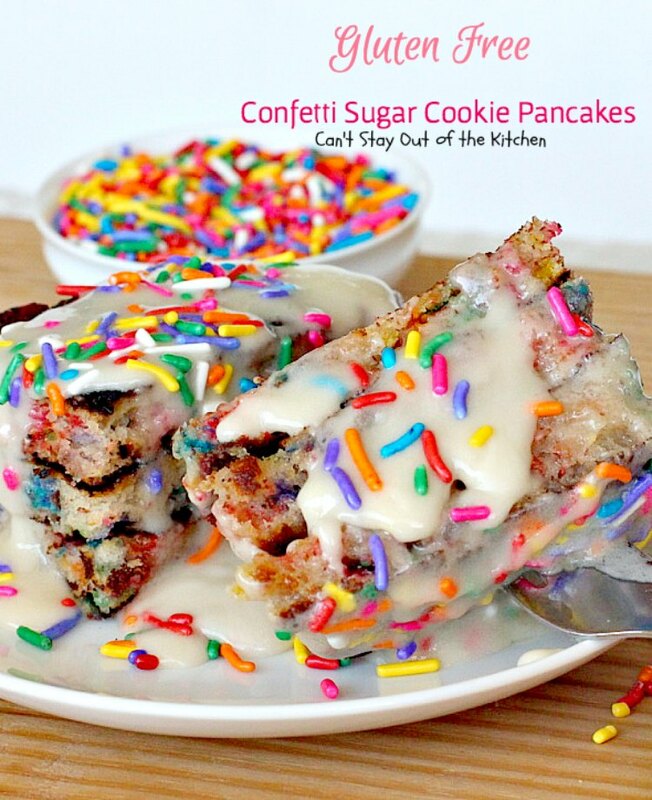 These Gluten Free Confetti Sugar Cookie Pancakes are some of the best you will ever eat! Look at all that frosting! Rich, decadent, a sugar high ready to happen! 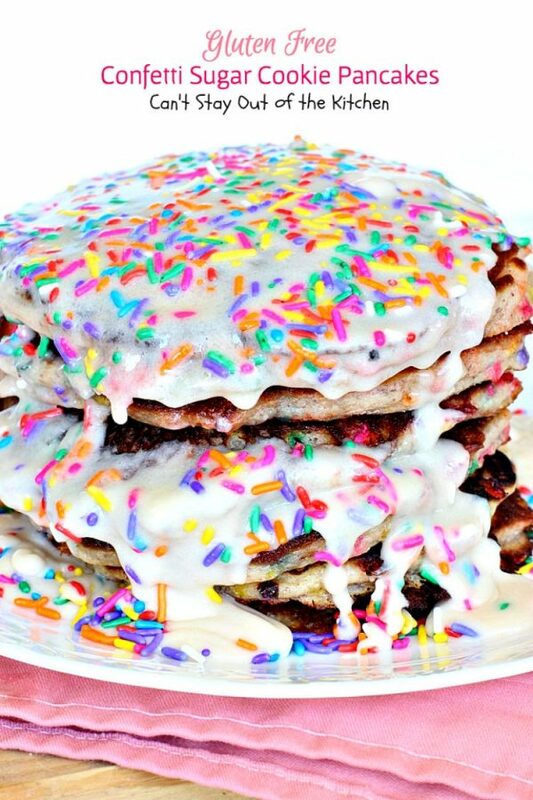 This is another picture that shows all the scrumptious icing drizzled over the pancakes and lots of confetti sprinkles (jimmies) that I added on top. 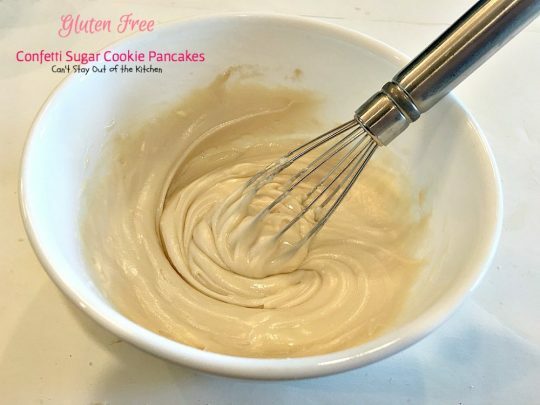 You have to make the icing thick as the hot pancakes will melt some of it and if it is too thin it dissolves entirely into the pancakes. YUM! 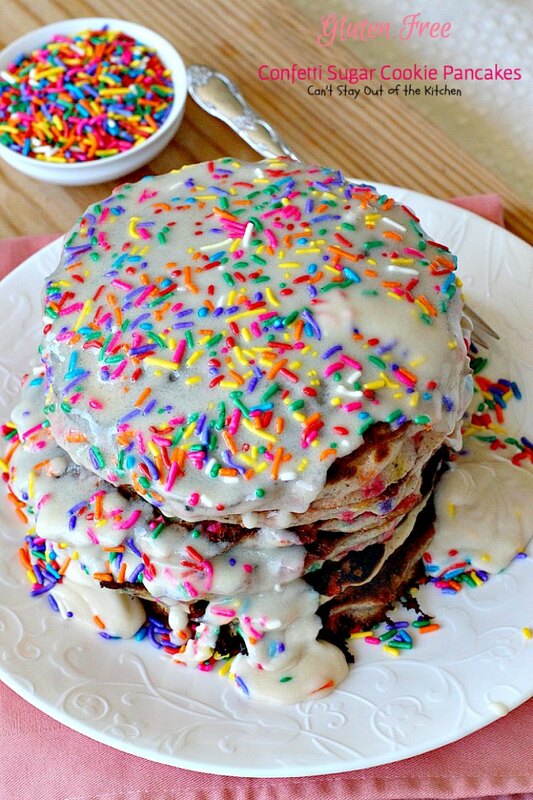 All of those sprinkles are amazing! 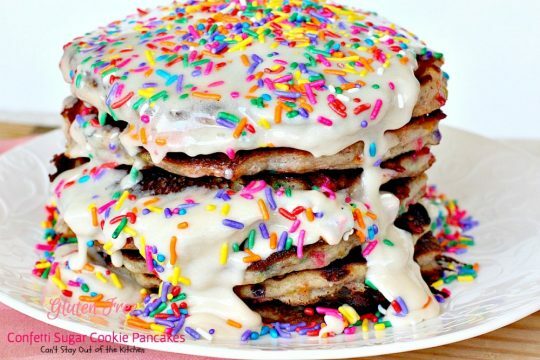 And the way the icing drips down the sides of the pancake stack looks heavenly! Well, Elise, these were so UNhealthy, but WOW they tasted so amazing! I scooped up some of the icing for every bite. I guess it was a little bit like eating cake! Thanks for adding the chia pancakes on your site. You’re welcome. Your stuff looked great!